Does your siding need replaced? You may not want to invest a lot of time or energy in maintaining the appearance of your home’s exterior. Repainting, caulking or sealing your home’s exterior every few years can become costly. E & M Remodeling has options that can decrease the time you spend maintaining your home’s exterior, while at the same time improving its appearance and value. All of our siding products are covered by lifetime material warranties. Take a look at a few of the siding replacement options we offer below, or if you are located in the Salem metro area (Albany and Corvallis) area than please contact us to have one of our siding installation and replacement specialists contact you and provide you with an estimate for your project. Vinyl – Vinyl replacement siding can enhance the elegance, beauty and energy-efficiency without all the required maintenance that wood, aluminum or asbestos siding demands. It is durable and will not rot, peel or dent, providing you with a maintenance free, cost efficient solution to your siding needs. All of our vinyl siding products are approved by the Vinyl Siding Institute. Our vinyl siding products are all Energy Star certified. They have been recognized by the U.S. Department of Energy and the U.S. Environmental Protection Agency as energy-efficient products that promote environmental and economic benefits for consumers. Fiber Cement –Fiber cement siding provides a low maintenance option for those who prefer the more traditional appearance of wood siding. Unlike wood siding, fiber cement will resist rotting, cracking, and damage from the elements or impact. It is an excellent choice for homeowners who are concerned with moisture or potential termite damage. It can be installed in a variety of colors options, or it can be painted in the future. E & M Remodeling proudly offers James Hardie Hardiplank and Certainteed Weatherboards siding to enhance the beauty of your home. Insulation – Insulation is a vital element of your siding system. Choosing the right kind of insulation for your home can help reduce energy bills and wasted energy. Your home will be able to keep a more constant temperature throughout the year if it is wrapped with insulation. Additionally, insulation can act as a sound absorber or barrier, keeping outside noises to a minimum. E & M Remodeling offers a variety of insulation products when installing a new siding system, including Fullback Insulation, Tyvek, Amocor, and Greenguard. 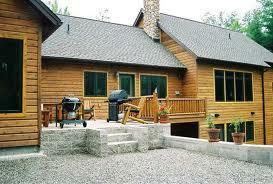 Wood – Made primarily of cedar and redwood, wood siding comes in a variety of styles and sizes. There are many great options for siding replacement or for siding installation on a new home. Choose from solid wood boards, shakes and shingles, all of which are extremely durable and long-lasting products. Be sure to ask about factory-treated products. Engineered Wood – Engineered wood siding is the perfect option for homeowners that want the natural beauty of solid wood siding, at a lower budget. This product is specifically designed to eliminate natural variations that are found in wood siding, to resist deterioration and to be cost effective for homeowners during and after installation. Cellular PVC – Cellular PVC, a solid extruded material, has added benefits of low thermal expansion and it is low-maintenance. There are a variety of styles and colors that can be matched to complement the siding on your home. Ask our Project Consultants for more information about Azek Trimboards and Koma Trimboards. Fiber Cement Trim – Fiber cement trim is another durable product that is resistant to many of the issues that homeowners come across with their existing trim. Fiber cement trim is engineered to resist rotting, cracking and warping, as well as termites and mildew. This product is good for areas that experience a range of seasons and temperature changes – it will not warp as a result of variances in weather. Vinyl Clad Wood – Vinyl clad wood can be used around window and doors to accent the aesthetic of your home. Since the exterior holds the same properties as vinyl trim, homeowners will never need to paint and it will resist chipping, cracking and peeling. If you are looking for a reputable, local siding contractor than your search ends here! We have a fantastic team of siding installers and siding replacement contractors who have tons of experience installing replacement siding for homeowners in the Dallas, Monmouth, Salem, Corvallis and Albany areas. Please contact us for a free siding replacement or siding installation estimate! We look forward to the opportunity to work with you.